Every other year my beer life and my map life collide- when the International Conference on the History of Cartography moves to its next host city. I skipped the 2011 Moscow version, so my last one was in Copenhagen, where I collaborated with a (pre-celebrity status) Shaun Hill on a beer for the conference when he was with Nørrebro Bryghus : Arctic Wit, labeled with a map from the opening exhibit. 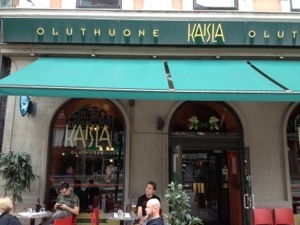 Thanks to Matthew Edney (a rock star in the map world yet unknown in the beer universe) who sent me a link to the Helsinki Beer Trail, Kaisla was my first stop. It’s deceptively small because it is made up of a maze of cozy rooms- lots of brick, stone, and wood- which I learned is the Finnish way. Not only do they have beers that are either hard to find or unavailable in Massachusetts (Alaskan Smoked Porter, Cantillon Vergnonne) they also strive to feature Finnish craft beer on draft. 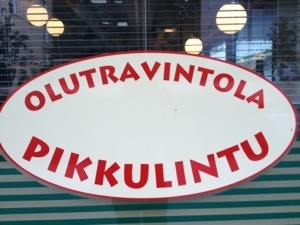 Huvila Pekko pale ale was my favorite: clean, well conditioned, and plenty of hops. 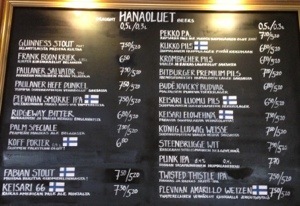 The Keisari 66 (“American Pale ale”) and Plevnan Amarillo Weizen were also super. 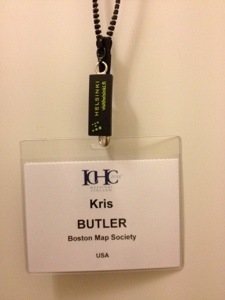 Beer and maps were intertwined all week. 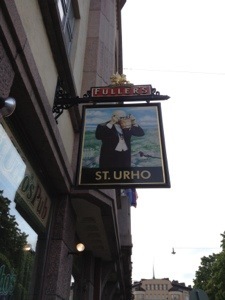 Near the opening reception at the National Museum of Finland is a little bar called St. Urho, where I first tried the Finnish native beer called Sahti. It wasn’t on the menu- I asked for it everywhere I went. It’s unstable (hence doesn’t travel well) but a true local flavor. It smells like raw sweet dough and strawberries. It’s cloudy and sweet- almost like wort but hot. This particular one was 8%, which is higher than most. 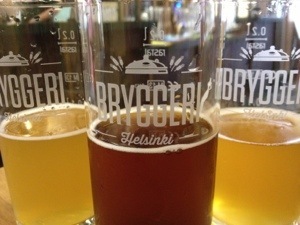 Matthew’s tips were spot-on, yet another map/beer geek, Nick Millea of the Bodleian Library at Oxford- found the newest gem: Bryggeri Helsinki. 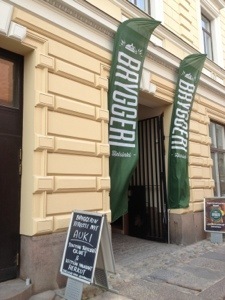 If you only have time for one beer destination in Helsinki, stop here. 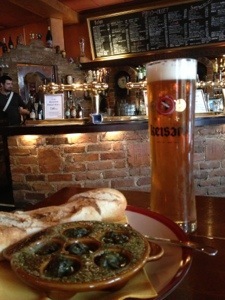 All four house beers are fantastic, the food is quite good, and the service is top notch. Plus they carry other Finnish craft beers so you can really get a taste for the scene. 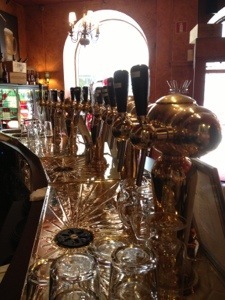 The house beers were a pils, weizen, altbier, and summer ale (a light IPA). I could drink the summer ale for days. Oh wait- I did! 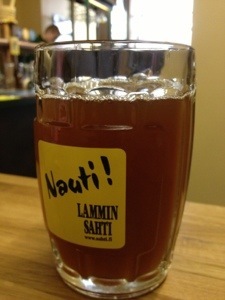 To top it off, Bryggeri Helsinki serves sahti from Lammin. The glass of it below says “enjoy” not “naughty”! 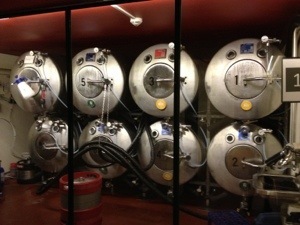 Every now and again I come across a special place and think – wow, this is what a beer bar should be. That’s Teerenpeli. 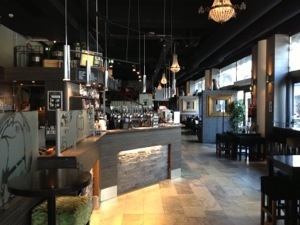 The outside isn’t promising, but once inside it’s open, hip, warm, modern, cosy- all at once. And the second floor has a secret terrace- very private compared to the sidewalk space near the entry. 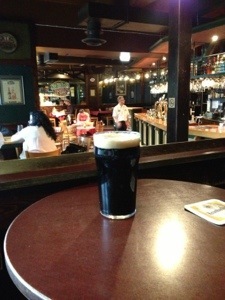 And the beer! After a brief conversation my waiter brought me a taste of an IPA still in the fermenter. Heady Topper watch out! 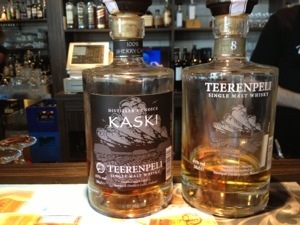 Did I mention they distill their own whiskey? 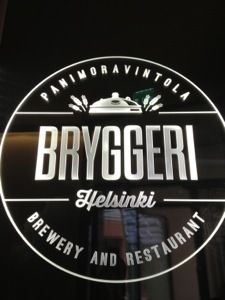 I stopped in several other wonderful craft beer gems in Helsinki: Bruuveri and Villi Wäinö stood out. But I was pressed for time (having as my primary purpose the International Conference on the History of Cartography, with lecture after splendid lecture by day and special exhibits every night) and thought I would have to miss the RB #1 rated beer destination in Helsinki: Olutravintola Pikkulintu. It’s a few kilometers out if town. But thanks to my Swiss/Albanian friend Endrit, I made time. RateBeer has it wrong though- this is a whiskey destination. The beer is Finnish craft: Siperia stout aged in a spirit barrel, Panimiravintolic from Tampere. But the single malt selection- dominating every millimeter of space- stole the show. Gëzuar! I absolutely nauti’ed this blog! Having only been to Lappland in the depths of winter where Finlandia flowed aplenty washing down reindeer pies and other Nordic culinary delights, I never so much as caught a whiff of a beer there. 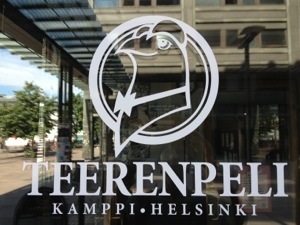 Great to hear, therefore, that Finnish craft beers are alive and hopping their way to the palates of oficianados like you and others who are spreading the good news. Bravo ja kiitos!